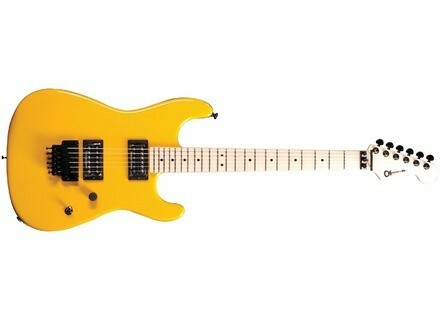 San Dimas Style 1 HH, STC-Shaped Guitar from Charvel in the Pro-Mod series. Charvel instruments have enjoyed a matchless 30-year reputation as custom tone machines revered by the world's most talented players. But as Charvel fans worldwide know, it's been a very long time since the company introduced a U.S.-made production guitar, which is exactly why Charvel is so excited to unveil not one but three such models. The new guitars are the San Dimas Style 1 2H, the San Dimas Style 2 2H and the So-Cal Style 1 2H, all three of which aim at taking traditional electric guitar designs to stratospheric heights of Charvel high performance while remaining attainable to the players who've always wanted a fine Charvel guitar but couldn't afford one an undeniably appealing opportunity given the high prices of similar import guitars. The (Strat Shaped) San Dimas Style 1 2H and the (Tele-like) San Dimas Style 2 2H both feature an alder body with a black polyurethane finish (the latter with a contoured back). Both have a one-piece maple neck with a 12"-16' compound radius fingerboard, a Seymour Duncan JB (SH-4) bridge pickup, a Seymour Duncan '59 neck pickup, a Floyd Rose tremolo unit, Grover mini-tuners, black hardware and included gig bag. The So-Cal Style 1 2H model features an alder body with a pickguard and a black polyurethane finish. It also has a one-piece maple neck with a 12"-16" compound radius fingerboard, a Floyd Rose tremolo unit, Grover mini-tuners, black hardware and an included gig bag. Its signature tone comes from a DiMarzio Tone Zone bridge pickup and a DiMarzio Evolution neck pickup. The close ties between Charvel/Jackson and the Fender Musical Instruments Corporation have permitted Charvel to use under licence the original body designs of the Stratocaster and Telecaster as well as the Strat's headstock design. As noted, the guitars come in a sleek black finish. Notably, however, each of these three guitars will also be released in limited custom colors that will replace each other quarterly. In July 2008, for example, the San Dimas Style 1 2H will be released in Candy Red, the San Dimas Style 2 2H in Pegan Gold and the So-Cal Style 1 2H in Candy Tangerine for three months only. At the end of this first three-month period, those three colors will then be "retired" and replaced by a new custom color for each model (announced just before release) for the next three-month period, and so on. All three models are manufactured in California and are announced for this summer at an MSRP of $999.99. Fender Billy Corgan Stratocaster Fender announces its new Artist Series guitar, a Stratocaster designed to the specifications of the Smashing Pumpkins' frontman and six-stringer, Billy Corgan. Gibson Robot SG Special LE Gibson Guitar has released the new limited edition Gibson Les Paul and SG Robot guitar models in a new red Metallic finish to meet continued worldwide demand and to be featured at this year's Summer NAMM show in Nashville, June 20-22, 2008. Martin unveils new signature models The Martin Guitar Company introduces new signature models at the 2008 Summer NAMM show, including models celebrating guitarists Tim O'Brien, Diane Ponzio and Merle Travis.